Introduction : Benign bone tumour, vascular and very painful, about 1 cm in size; elicits sclerotic reaction by the parent bone when the lesion is in the cortical bone; In cancellous bone the lesion is limited by a thin rim of sclerotic bone; in the spine it can cause scoliosis; if the lesion is in the metaphysis which is intraarticular can produce symptoms of arthritis; If the lesion is in the evolving stage it may not be seen routine plain radiography. Introduction: Benign bone tumour arising from chondroblasts; usually present in the small bones of hands and feet and asymptomatic for long time; patient presents usually with a pathological fracture or sometimes pain. Differential Diagnosis: Aneurysmal bone cyst, Tubercular dactylitis, Giant cell tumour, clear cell chondrosarcoma & acrometastases. The latter two are extremely rare. Introduction: Benign bone tumour arising from fibroblasts. Usually seen in the metaphyseal region of immature skeleton and most of the times it is asymptomatic. It may be an incidental finding in a x-ray taken for some other purpose or bigger lesions may present as pathological fractures. They have a characteristic radiological appearance of serpigenous margins which have pencil lined sclerotic borders. Situation 2. a) clinical diagnosis may not be possible. Big lesions are curetted prophylactically to prevent pathological fractures and bone grafted. Once they present with a pathological fracture – either they are immobilized in plaster cast till the fracture unites and then curetted and bone grafted or the fracture is openly reduced and internally fixed and at the same time the lesion is curetted and bone grafted. Introduction: These lesions mimic tumours and they look alike. Usually occur in adolescents. Lytic lesions with clear cut zones of transition. ABC may show fluid levels in MRI; Fibrous dysplasia has ground glass matrix They may present with pain and swelling or with pathological fracture. Situation 1. a) clinical – nothing specific except pan]in ful swelling, not large or may present with pathological fracture. c) Treatment – curettage and bone grafting; if the patient has a pathological fracture, either the limb is immobilized in plaster cast till the fracture unites and then curettage and bone grafting carried out or the lesion is curetted and bone grafted and at the time the fracture is internally fixed. Introduction: A benign very slow growth of in the subcutaneous tissue or intermuscular connective tissue – does not metastasize but recurrence rate after excision is very high. Differential Diagnosis: Other malignant soft tissue tumours like synovial sarcoma or fibrosarcoma. Introduction: Freak outgrowths from the growth plates – multiple osteochondromatosis- which is familial and producing remodeling and growth abnormalities and ten times more potent for malignancy than its solitary counterpart. Freak inclusions of cartilaginous masses from growth plates into the metaphysic producing streaks of lucency is Ollier’s disease – usually present in one side of the body and produces marked growth anomalies. Proliferation of cartilage in the medullary substance of small bones of hands and feet producing globular swellings is multiple enchondromatosis. This condition is not familial and is also associated with growth disturbances. Incidence: The former is quite common whereas the other two are rare; multiple osteochondromatosis is 10 times less common than solitary osteochondroma. Differential Diagnosis: usually none; One has to be vizilant to look for a malignant transformation in one of the lesions – the more proximal the lesion is to the axial skeleton more are the chances of malignancy. Situation 1. a) clinical: multiple hard swellings in the metaphyseal regions of long bones or on the flat bones or multiple globular swellings in the short long bones of hands and feet with growth disturbances. Recent increase in size and onset of pain to be enquired. Mechanical restriction of motion of a neighbouring joint or compression of a nearby nerve are to be looked into b) Investigation – Only plain x-ray is possible d) referral criteria – all cases to be referred to higher centres. Introduction: .A benign bone tumour arising from undifferentiated connective tissue cells of bone marrow. Occurs in the mature skeleton usually around knee and at wrist. It is an aggressive tumour and the chances of recurrence following curettage are very high. A small percentage might even metastasise to lungs. Incidence: much more common in India, especially South India (4 to 6 times), than the western world. Differential Diagnosis: Aneurysmal bone cyst, Benign Fibrous histiocytoma and aggressive chondromyxoid fibroma., Hyperparathyroidism. Situation 2. a) clinical: same as above b) Investigations: Plain x-ray, CT scan, MRI, wide bore needle biopsy c) Treatment: Curettage with h igh speed burr, curettage with usage of adjuvants like phenol or liquid nitrogen (cryosurgery) have been in usage. However, extended curettage has the least chances of recurrence. Excision in toto is ideal if the bone involved is expendable (like lower ulna, proximal fibula). In instances like lower radius, excision and reconstruction using proximal fibula is practiced. In weight bearing bones like distal femur or proximal tibia, when the the bone is totally destroyed, resection arthrodesis (Enneking procedure) is ideal if the patient belongs lower socioeconomic group. But if the patient belongs to higher strata where the load demands are less, excision and custom mega prosthesis may be practiced. In fungating cases or after repeated recurrences, an amputation may be the last resort. Introduction: occurs in second decade of life. Differential Diagnosis: Early lesions are difficult to diagnose unless one has high index of suspicion. Any pain in the metaphyseal region following a minor injury and disproportionate to the injury or if the pain is slowly increasing day by day after minor injury and especially without fever should lead the clinician to suspect this sinister disease. If it occurs after skeletal maturity, Giant cell tumour also must be thought of. Prevention: Genetic engineering is under trial to prevent the lesion in children who are genetically prone to suffer. Situation 1. a) clinical: as described earlier in diff. diag. In late cases pain preceding a spindle shaped swelling in the metaphysic of long bone must give suspicion of osteosarcoma. b) Investigations: plain x-ray c) referral criteria: any suspicion that the swelling is malignant. c) Treatment: In early cases – chemotherapy for 6 weeks followed by limb sparing surgery (excision of tumour in toto and replacement by custom mega prosthesis), after histological examination of the excised tumour for tumour necrosis, the chemotherapy may be suitably altered. Patient followed at frequent intervals for local recurrence and lung metastases. In cases of late presentation where tumour excision is not feasible a course of chemotherapy is followed by amputation of the limb – chemotherapy is continued. Where lung metastases are present amputation of the limb is palliative. Differential Diagnosis: Non aggressive lesions may be mistaken for benign tumours especially Fibrous Dysplasia. Prevention: Secondary chondrosarcomata may be prevented by proper treatment of primary cartilaginous lesion. Situation 2. a) Clinical: same as above b) Investigations: CT scan of part involved, CT scan Chest, MRI, Isotope bone scan, Needle Biopsy c) Treatment: Chondrosarcomata are resistant to chemo and radiotherapies. Hence excision in toto, short of amputation, is the only alternative. Secondary and peripheral chondrosarcomata may be amenable for excision. Primary or secondary chondrosarcomata of the limb girdle may be difficult to treat surgically but excision and reconstruction may be tried depending on the situation. Custom made prostheses may be tried for chondrosarcomata of proximal humerus and femur if the lesions are intracompartmental. Inoperable tumours need disarticulation. Introduction: A malignant bone tumour where the cell of origin is uncertain; usually occurring in the diaphyses of children. It can also occur in the metaphyseal regions. When the tumour occurs in adults the ilium is more commonly involved. It is a fast growing tumour with a lot of soft tissue swelling. Differential Diagnosis: Osteomyelitis is a major competitor for diagnosis not only clinically but also radiological and histological. 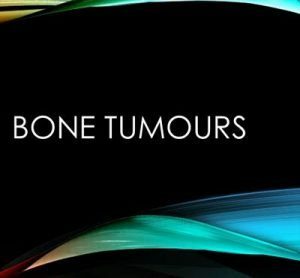 Other round cell tumours of bone also should be thought of. b) Investigations: x-ray, CBP & ESR, MRI of the part, CT scan of chest, wide bore needle aspiration – material must be sent for histopathology and culture of pyogenic organisms as well. The dictum “culture a tumour and biopsy an infection” holds good here. c) Treatment: Though earlier on Radiotherapy was best suited for Ewing’s sarcoma, present day sheet anchor is Chemotherapy. After an initial course of chemotherapy, wherever feasible, the tumour is resected and reconstruction done (appropriate surgery). For a recurrence of the tumour radiotherapy is preferred since the recurrence is from cells which are resistant to chemotherapy given earlier. Where resection of the tumour is not possible amputation is performed. Incidence: not rare; 10 % of hematological malignancies., 1 % of all forms of cancer. Differential Diagnosis: The main contender is osteoporosis with compression fractures; Multiple metastases especially from prostate in males and breast in females should be thought of; Osteomalacia in late adulthood and Fibromyalgia syndrome are also to be differentiated. Situation 1. After suspecting a metastatic deposit, after x-ray examination patient has to be referred to a metro level hospital. Situation 2. a) clinical: Localised or generalized pains in an elderly individual not responding to analgesics must be investigated. They have a pathology unless proved otherwise. A detailed clinical examination of the systems from which a primary is likely to occur should be carried out b) Investigations: CBP, ESR, x-ray chest, CT chest, Serum Ca, P, ALP, PTH, Serum protein electrophoresis, wide bore needle aspiration biopsy of the lytic lesion detected on x-ray. Other blood investigations to detect cancers of the respective organs (like PSA , Ca 128 etc.) are to be carried out c) Treatment: of the primary depends on the cause. For a pathological fracture (or an impending fracture), curettage of the lesion, filling with bone cement and internal fixation preferably with an intramedullary nail is palliative and gives comfort for the rest of the life. Of the many congenital anomalies of Orthopedic interest, only two conditions which are common are discussed here – they are CTEV (Congenital Talipes Equino Varus) and (Congenital Dislocation of Hip). Others are to be treated in specialized centres. Introduction: The most common congenital anomaly seen in Orthopedics also referred to as CLUB FOOT. The deformity can be unilateral or bilateral. The common question that needs to be answered by the primary clinician is whether the foot is normal at birth – when dorsiflexed the dorsum of the neonatal foot touches the shin of tibia. If it does not , there is mild equinovarus deformity. In CTEV, the foot has four components of the deformity – plantar flexion at ankle, inversion of foot at subtalar joint, varus of the forefoot at the midtarsal joints and internal torsion of tibia. Differential Diagnosis: Other conditions which produce the talipes equino varus deformity should be thought of – meningomyelocele (or spina bifida occulta in adolescents as revealed by external tell tale scars like fobrofatty nodule in the lumbar spine, tuft of hair or pigmented skin patch), Cerebral palsy of lower limbs, Arthrogryposis congenita, nerve injuries to lateral popliteal nerve, anterior poliomyelitis. Situation 1. Non metro hospitals. b) Investigations: x-ray in an older child. c) Treatment: the clinician has to familiarize himself with the technique of manipulation and serial plaster casting. Otherwise the patient has to be referred to metro hospitals. d) Referral criteria – if the clinician does not know the technique of manipulation and plaster cast application; if there is no progress in correction of deformity after 6 to 8 manipulations ; if the child presented for the first time at the age of one year or the complication of rocker bottom foot has developed. c) Treatment: manipulation of foot, preferably by Ponseti technique, even if the child is more than one year age to make the foot supple before surgery. Serial plaster casts appled. If the improvement is not satisfactory by 8 months of age surgery in the form of posteromedial release is suggested followed by serial plaster casts. Once correction is achieved and the child is not yet walking a Denis-Browne splint is prescribed. Corrective shoes are to be given after the child starts walking. If the heel varus is persisting even at 6 yrs age, Dwyer’s calcaneal osteoteotomy is advised. For persisting round contour of the lateral border of the foot one of the lateral column shortening operations is performed. A supramalleolar osteotomy of tibia is indicated for persisting excessive tibial torsion. If the surgeon is conversant JESS application is a viable alternative. In neglected cases beyond 12 yrs of age a triple arthrodesis may be performed. Incidence: The exact incidence in India is not worked out though the condition is not very rare. Prevention: prevention of consanguinous marriages might reduce incidence. a) Clinical: Barlow’s and Ortolani’s signs to diagnose dislocatable or reducible hips. Dislocated hip has a short limb, increased creases on the inner aspect of thighs, femoral head present anteriorly , abduction of hip is restricted and telescopy positive. c) whether the hip is dislocatable or dislocated, closed manipulation performed to reduce the hip and a POP spica applied in human position. d) if the diagnosis is doubtful or hip cannot be reduced by closed manipulation the patient must be referred to higher centre. b) investigations: plain x-ray of pelvis for both hips; Ultrasound examination of hip if the child is 6 months or less of age. In failed closed reductions an arthrogram of the hip may be performed. CT & MRI are very rarely indicated. c) Treatment: in an infant closed manipulation of hip and plaster spica in human position. In a slightly older infant, a preliminary traction might help closed reduction. In an older infant, open reduction may be required followed by plaster spica. If the acetabular coverage is not enough, Salter’s innominate osteotomy is indicated. If the acetabulum is roomy, Pemberton osteotomy may be performed. In a slightly older child, in addition femoral shortening derotational osteotomy may be beneficial. A shelf operation to augment acetabular coverage may be required.